Sadly, June’s Deal-A-Day website specials have ended. In celebration on June’s Deal-A-Day specials, I put together a great Mystery Box for May’s Raffle Winner, Andrea Z. of Ogden, KS! 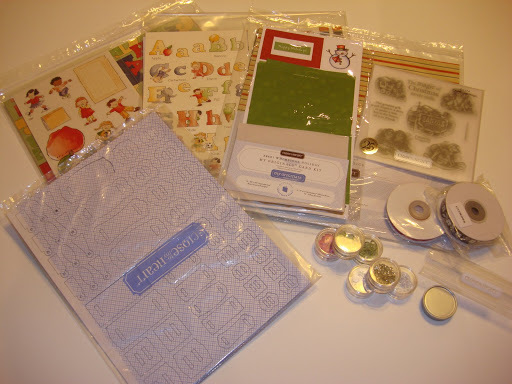 This goodie box includes a Level 1 and 2 paper pack with coordinating Level 1 and 2 My Stickease Adhesive Assortments, My Originals Christmas card set, Creative Basics Everlasting paper pack, My Acrylix stamp set, Creative Elements chipboard assortment, bulk ribbon, and some cool embellies! Whoa! This goodie bag is valued over $80.00! Congratulations! Andie earned raffle tickets by attending two clubs events, placing an order, and bringing a friend to club. Thank you to everyone who attended a monthly club, stopped at my Open House, or swung by my booth at the Manhattan Juneteenth celebration despite the rain! Have a Happy 4th of July and can’t wait to see you! ← July’s Scrapbook Kits…Moon Doggie!